Just one day to visit the south? Make it count! You only have one day to explore Pompeii and the Amalfi Coast, so make it count! Take the pressure off and make the most of your short time in this beautiful and fascinating part of the country with our guided Pompeii tour from Rome. You’ll embark on an in-depth exploration of the ruins at Pompeii and a relaxing drive along the beautiful Amalfi Coast, with time to let your hair down and explore the jewelbox seaside town of Positano. Including air-conditioned round-trip transport, guides and tickets- we’ve taken care of all the details. 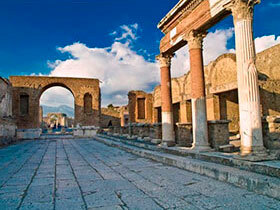 Discover world-famous ruins on our guided Pompeii tours from Rome. Few places send shivers up your spine like Pompeii, the thriving Roman city frozen in time by the volcanic eruption of 79 A.D. The volcanic ash preserved Pompeii’s buildings, streets, mosaics, and frescoes, making Pompeii a site unlike any other in Italy: it’s a complete ancient city you can explore just as if it were 2000 years ago! 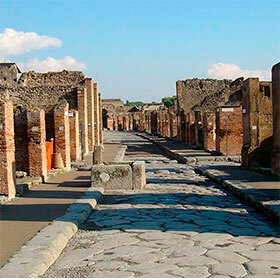 Explore the city of Pompeii with an expert, English-speaking guide who will help you make the most of your time here. In two hours you’ll see the most fascinating sites of the city, from plaster death casts to Pompeii’s fast food joints and streets cut out by carriage wheels 2000 years ago. Visiting on a day trip, it’s impossible to walk all of Pompeii, but our carefully-planned route means you’ll see the best of it, with the most representative and well-preserved buildings it has to offer. Together you’ll explore the best of Pompeii, from the Roman Forum and the brothel to the world-famous plaster casts of those killed in the eruption. Feel the site come to life with your guide’s dramatic stories and fascinating anecdotes about what life was like before and during the eruption. We time your visit to Pompeii to avoid the worst crowds, so either before or after your Pompeii tour, you’ll head further south. Your tour leader will accompany you as you revel in the stunning views and exciting twists and turns of a panoramic drive down the Amalfi Coast. Along the way you’ll hear stories about life in this beautiful region of Italy and get some background about our next stop – lovely Positano. A pastel resort town perched on the cliffs, Positano is renowned for its romance and elegance. 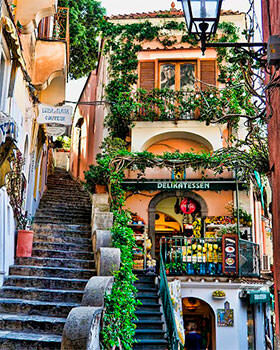 Follow in the footsteps of Shelley, Goethe, Steinbeck, and the town’s myriad other famous visitors as you climb Positano’s winding staircases and explore its narrow streets. Poke into the upscale boutiques, order sandals made to fit your foot, bring a swimsuit and take a dip in the clear waters, or relax over a fresh fish lunch, all the while admiring unbeatable views. From the moment you are picked up directly at your hotel to when you return that evening, with a full stomach and head filled with vistas and history, we’ll take great care of you. We’ve organized comfortable, air-conditioned transport in a small bus because larger buses are a nightmare on the winding Amalfi Coast roads. We’ve kept our groups small, with a maximum of only 12 people (often a lot fewer), so your tour will be intimate and you’ll get to know your whole group. For your Pompeii tour we’ve arranged skip the line tickets so you won’t have to wait in long lines and, if it’s busy in Pompeii in the morning (as it sometimes can be with cruise ship arrivals) we’ll be flexible, reversing the order of your day trip to be sure that you’re getting the best experience. The most important element of any tour though, is your guide, which is why we’ve spent years building a team of the best, most passionate, fun and enthusiastic tour leaders. So you can sit back, relax and enjoy yourself in the knowledge that you’re getting the best possible experience of southern Italy on our hassle-free day trips from Rome. 120,00 € Reduced tickets for teens 6-17 y.o. FREE For children under 6 y.o.! Length of the tour 10 hours approximately. FREE Infant 0 - 5 y.o. The ruins of the Roman city of Pompeii, the open air museum frozen in time, where the ancient Roman settlement has been preserved in detail with an expert local guide. Relax and enjoy a drive along the Amalfi Coast with a stop in Positano. Round-trip transport & a friendly English-speaking tour leader to avoid common problems. Expert & Entertaining English-speaking driver. Relaxed & comfortable guided tour in Pompeii. Quick entrance to the Pompeii archeological site. Small groups maximum 12 people or less. Bring a bottle of water, is always handy in hot summer days. We recommend you wear comfortable walking shoes and if rain is forecast, bring a Small umbrella as well.